This should be familiar to all the pilots out there. The E6B flight computer has been a staple of pilots for many years. I've found that when teaching people how to use it I could never find a good teaching aid, so I have come up with my own. Using the HDMI output of the BlackBerry Z10 smartphone I can have the display appear on a large screen TV. Large digital readouts make it easy to read the wheel positions but still require the students to carry the decimal place in their heads, as they would with the real E6B. While intended as a teaching aid, it could also do the job in the cockpit. On the E6B 'side a number of pre-canned calculations may be selected. These calculations position the wheels relative to each other for the calculations, then lock them together so they spin as one unit. 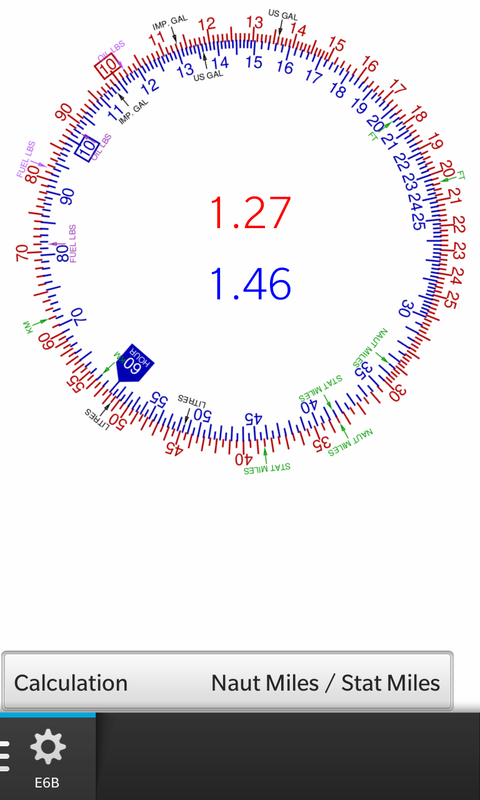 Rotating the wheels until the desired value (on either the inner or outer wheel) is at the top will cause both outer (red) and inner (blue) values to be displayed. The above image shows 30 US Gal of aviation gasoline weighs 180 lbs. (Or 3 US Gal weighs 18 lbs). 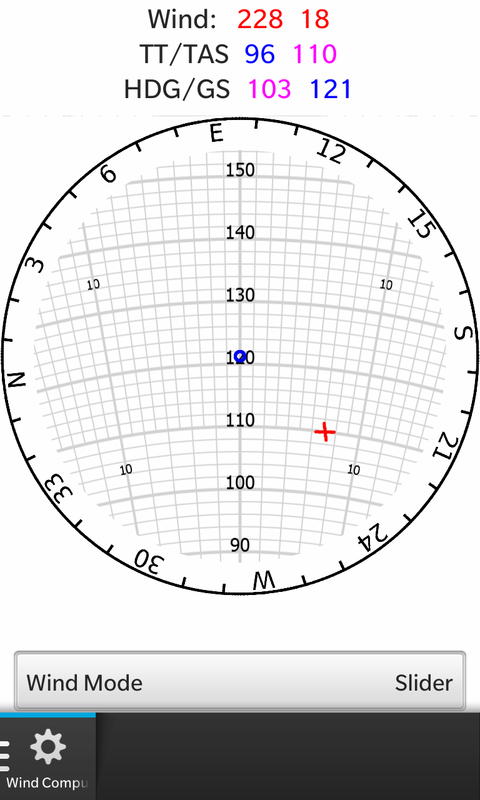 On the wind side the compass rose is rotated to the wind direction, then a finger is slid out from the centre (in any direction) to mark the wind dot (red X) up from the grommet. 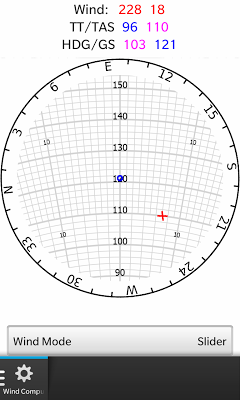 Putting a check in the box locks the wind parameters so the compass rose may be rotated to the true track, and sliding the finger up or down moves the slider until the true airspeed is under the wind dot. This application is available for free download for the BlackBerry Z10 (and Dev Alpha) from BlackBerry World.